Gives event organiser the opportunity to accept online bookings and hassle free payments at no extra cost. The system provides events with an automated online entries secretary helping to save time, stress, bank charges and extra man power whilst running your event. We aim to make accepting online entries as stress free as possible for Event Organisers. We take care of the whole process from uploading your online schedule, custom built entry forms for each event, managing entries and accepting Safe Secure payments. With our support and service all your event entries will be taken care of. Postal Entries The same process of a Booking fee is used and no charge is made to the event organiser for handling postal entries.Postal entries will be processed on the online secretarial system by us. The Entry form is sent direct to us along with a cheque payment made out to your event/organisation which we can bank for you. Times can be calculated and published on our website. Crib sheets for dressage, and optimum times can be provided. A4 Master Score sheets will be sent to you for printing. If you would like further information about our Equine Booking system please do Email us or call us on 07962 251 696 to discuss your individual events requirements. An automated Online Secretary that takes care of your entries at no added cost to the event. Email and telephone support for your entrants. Time Saving – it is proven that once an event offers online entries as little as 10% are sent in paper format. We set up everything for you and take care of your event entries, all you need to provide us with is your event schedule and event terms and conditions. A Bespoke Booking and entry form is made so you can ask your competitors any information you require, and event contact details. Your Event page can be linked from your club or organisations website and you will benefits from the large number of visitors the www.horse-events.co.uk website attracts each day. Once your Event has been uploaded to the website entries can be accepted immediately, riders and owners can book your events using our safe and secure payment gateway and your bespoke booking form. Your event entries are managed by Equine Bookings, Entries will only be accepted when full payment has been made. A record of your entrants and their details is recorded and available for the event organiser at any time through your own secure login page. Once your entries have closed a full list of your entries and their details will be sent to your via email in an excel format. Payments are made using our secure online payment gateway the money is transferred into our event client account and then transferred to your events account on the individual terms decided (weekly, monthly, no: of entries) a record of payments, and transfer is recorded. This process ensures Maximum security for the Entrants and means your event banking charges are kept to a minimum. An email confirmation is sent to the entrant to confirm what that have entered and the entry fee has been taken from their account. Your event Entries list is updated so you can see who has entered your event whenever you like. There are no banking or card charges to you as the organiser we pay these for you. In the case of entry fees having to be refunded this will be done in line with the individual events terms and conditions. 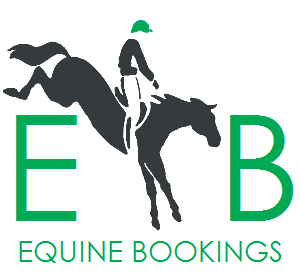 Equine Bookings acts as a booking agent on behalf of the event organisers the entrant’s contract is with the organisers not with the Booking Agent. Cancellations and Withdrawals: Each organiser will list their individual withdrawal and cancellation terms on their unique event page. When withdrawing or cancelling an entry these terms will be used. Refunds can be processed back onto the card in which the entrant paid on. Equine Booking will act as the event Secretary and can be contacted for entry queries. An additional event organisers contact details will be given as a point of contact for all other event queries.